'Cassleigh', the Augustus Cass Canfield estate designed by McKim, Mead & White c. 1902 in North Hills. The estate had Olmsted landscaping as well. 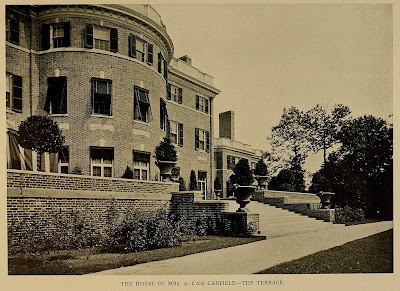 Canfield died right as the house was completed, his widow would go on to live here until 1915. The house was demolished c. 1940 and a large chunk of the estate now makes up Roslyn Estates and Christopher Morley Park. Top-heavy. Without distinction. Institutional. It might as well be an dormitory. Indeed it is. It shows that even the greatest of architects can have a bad day. 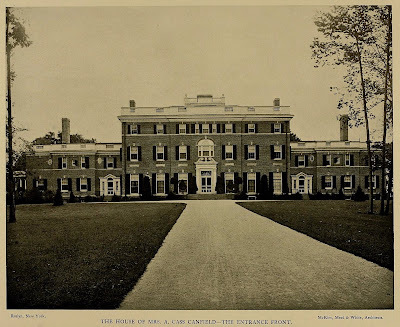 It is interesting to compare this house to their T. Jefferson Coolidge house at Manchester MA, and the Florence Vanderbilt Twombley House at Madison NJ. both with many details in common with this house, including certain awkwardness in proportion. The Twombley house garden front is particularly bad. The Coolidge house is the best resolved of the three. ah, but if mrs. canfield had said "here's the keys - i'll pay all your expenses just to live here", i'll bet these petty concerns and complaints would fade away. What I find interesting is that Harbor Hill was being built at the same time just around the corner, and while I haven't seen landscape shots of Cassleigh, the two estates seem like they couldn't be more different. I wonder who in the firm was responsible for this one?